It was the largest oceanographic field experiment in the 76-year history of Woods Hole Oceanographic Institution. Most research projects employ one ship and a dozen or so researchers; this one involved a fleet of six research vessels, more than 50 scientists from 12 institutions, 62 moorings, 350 assorted oceanographic sensors, nearly 100 tons of equipment, as well as an airplane, space satellites, and a squad of robotic undersea gliders. Over seven weeks in the summer of 2006, all of that inventory was focused on a 40-by-50-square-kilometer (24-by-31-square-mile) patch of ocean about 100 miles east of Atlantic City, N.J. The goal: to assemble a spatially three-dimensional, highly detailed picture of how sound waves travel through the complex, ever-changing medium of coastal waters. Those who work in these complicated ocean waters need to know how their instruments operate in them. So a consortium of three sponsors from the Office of Naval Research (ONR)—representing interests in acoustics, physical oceanography, and vehicles—pooled funds, experimental resources, and scientists to attempt a large-scale experiment to collect the fundamental data needed. Their goal was to advance basic understanding of sound propagation in a 3-D coastal ocean. Adding the third dimension potentially squares the amount of equipment required, as well as the costs, so this was an ambitious undertaking, even with pooled resources, said Jim Lynch, an acoustics expert and senior scientist at WHOI, who co-led the experiment. Unlike light, sound propagates efficiently through water, making sound the primary way for people to “see” beneath the waves. Sound is used by scientists, industries, navies, and others to communicate under water, to monitor the ocean’s moving water masses, to get images of the seafloor and structures beneath it, and to localize and track sources of sound in the ocean. The Navy has long used sound to detect objects under water. During the Cold War, it deployed acoustic systems all across the Northern Hemisphere to monitor submarines that lurked in the deep ocean. In deep water, sound waves do not interact with the ocean bottom, and they propagate through large, stable, slowly varying oceanographic features. Shallow waters, however, are anything but stable, simple, or predictable, making it harder to understand how sound propagates through them. The first confounding factor in shallow water, almost by definition, is the ocean bottom, which significantly interacts with and reflects sound waves. Sound waves reflect differently off seafloors having different topographies and compositions. The ocean also interacts with the atmosphere, and its surface is warmed or cooled by weather systems that change daily and seasonally. This produces water masses or layers near the surface that often have substantially different temperatures than deeper waters. These water masses change how sound travels through the shallow waters. The 10-to-50-meter-thick surface water masses are almost insignificant to sound in the deep ocean, which extends thousands of meters deep; but in coastal waters with depths of only about 200 meters, they have large impacts. Shallow waters also have more water masses that don’t mix and that constantly jostle against each other, creating the oceanic equivalent of atmospheric cold and warm fronts. Sound travels more easily through cold water, but refracts away from warm water. Some of these fronts are relatively stationary, fixed features, whereas others are swept along by currents and tides. Occasionally, swirling ocean eddies of various sizes travel through shallow waters, adding another layer of complication. As if all this weren’t complex enough, tides and topography in shallow water create waves within the ocean’s interior—so-called “internal waves,” which have important impacts on underwater acoustics (as well as many other areas of ocean study). All this variable oceanography—coupled with complicated and irregular ocean bottoms, and topped off with a sea surface cluttered with ships and waves—serves to scatter, reflect, dissipate, interfere with, channel and generally increase the uncertainty of predicting how sound waves travel in shallow water. 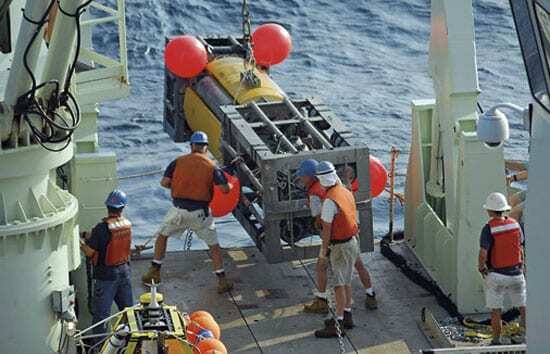 Planning for the experiment began in 2001 at WHOI, the University of Washington, and other research institutions. 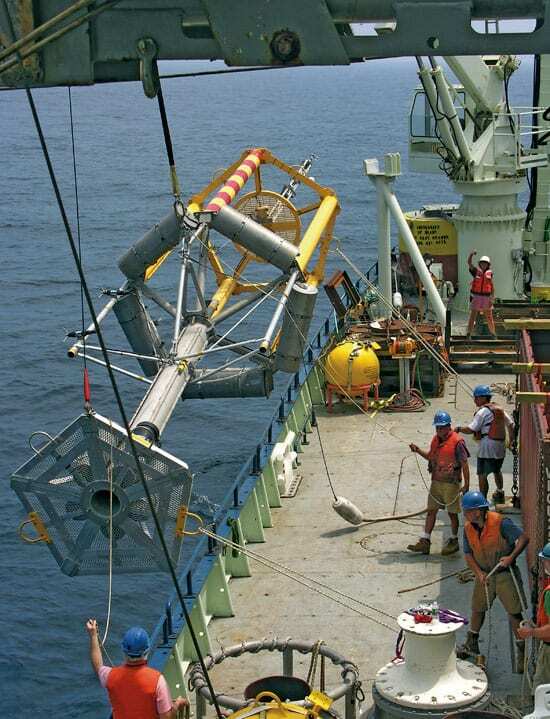 Acousticians, oceanographers, geologists, oceanographic vehicle developers, and other scientists assembled their expertise and resources to conduct a concentrated acoustics and oceanography study in a rectangle of ocean off New Jersey, whose geology, currents, and water characteristics had already been well-studied over the past decade. “This was an opportunity to continue building on that accumulated body of knowledge, using the latest technology and research advancements,” said Ellen Livingston, program manager of the Ocean Acoustics Program at ONR. That area’s proximity to WHOI made it convenient and affordable to study. Yet any fundamental shallow-water acoustics knowledge obtained there would be “transportable” anywhere in the world—to continental shelves in more far-flung locales, such as the Arabian Sea, for example. “Shallow Water ’06” began in full on July 24, 2006, when WHOI engineer John Kemp and a team of mooring specialists finished loading the WHOI-operated vessel Knorr with nearly 200,000 pounds of equipment. That included some 90,000 pounds of anchors to secure moorings to the seafloor. The moorings were mounted with instruments to measure temperature, salinity, currents, pressure, and other ocean characteristics. They also had devices to transmit and receive sound signals through the ocean and to record sounds emitted by shipboard sources, the ships themselves, and marine animals. The sounds produced for the experiment—an amusing assortment of chirps, whooshes, and beeps (including one that sounded quite rude)— were scrupulously kept below decibel levels believed to affect marine mammals, based on the latest research. The team placed some moorings 100 meters apart and others several miles apart in a carefully arranged T-shaped pattern that stretched both along and across the continental shelf. 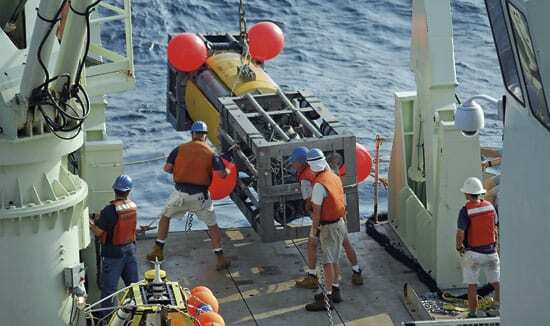 At the junction of the “T,” a 3-D array of oceanography sensors was deployed to examine fine-scale patterns of ocean internal waves, a key topic of interest for both Lynch and the experiment. Things did not begin auspiciously. On the first mooring to be deployed, a critical microprocessor on the main acoustic receiver array malfunctioned, threatening to compromise the experiment. But the researchers managed to repair it at sea and went on to position 57 moorings over five days, in advance of other scientists arriving via research vessels. (Five other moorings came later.) The T-shaped mooring array, continually collecting ocean and acoustic data, served as the foundation for many researchers. Success of the scientists’ project rested critically on the security of the moorings, which Kemp feared would be dragged up by unsuspecting fishermen who flock to the region each summer for lobster, scallops, and tuna. The scientists alerted their fellow seafarers by both modern means (sending text messages to fishermen) and ancient, well-proven ways (marking the moorings with orange flags). Another “traffic hazard” was fellow scientists. It wasn’t unusual for two or more research vessels to be working in the area at the same time; they stayed out of each other’s way using a Web site that tagged mooring positions and ship and glider tracks and gave daily updates of each other’s research status and intended ship tracks. Each day, scientists and engineers aboard the various ships exchanged data via e-mail. The main acoustic array alone brought back six terabytes of data, Lynch said, and the other ocean sensors, acoustic arrays, aircraft, and satellites will likely double that. Over the coming years, this cornucopia of new observations should provide the grist for the acousticians, physical oceanographers, geologists, and engineers involved in Shallow Water ’06 to make significant leaps in understanding the shallow-water environment. Although the ocean often scatters sound energy almost randomly to create a “messy” acoustic picture, he explained, regular ocean features—such as ocean fronts or internal waves— can trap sound, allowing it to propagate more efficiently and perhaps amplify local noise levels. “This can affect the ranges over which marine mammals can hear and be heard and how well sonars can work,” Lynch said. Funding for this research was provided by the Office of Naval Research, the Defense University Research Instrumentation Program, Rutgers University, and the Naval Research Laboratory.